Here we go with another video game movie! 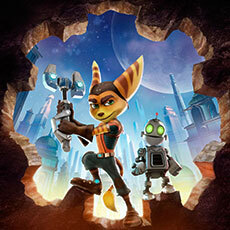 If you’ve read the recent Ratchet & Clank review, you’ll already know that I’m not sure what jump-started this stampede. 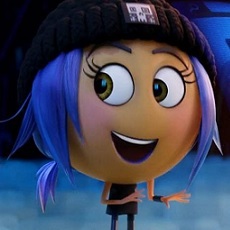 A very smart fellow in the forums suggested Wreck-it Ralph might have been the catalyst. That’s a very good thought, but I’m not completely convinced. As the just released Honest Trailer for that film jokes: Wreck-it Ralph is an “adorable animated adventure that finally cracked how to make a good video game movie, by not focusing too much on the video game”. But knowing how Hollywood thinks, the forum poster might be right and maybe “video games” is all film producers took away from that movie’s success. That Honest Trailer joke may also hide a deeper truth. Perhaps the best way to make a good video game movie is to not focus too much on the video game. 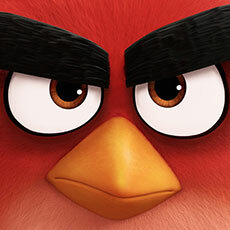 If that’s true, The Angry Birds Movie gets off to a promising start. Bird Island is inhabited by flightless birds who believe their island is all there is in the world. Red suffers from a short temper and a lack of a filter on his words before he speaks. This had already caused him to be banished to live a little away from the rest of the community. But his most recent outburst has gotten him sentenced to anger management classes. There he meets a fast-talking, fast-moving bird named Chuck and a large bird with a literal short fuse named Bomb. The bird world is stunned with a boat full of green pigs shows up and reveals they are not alone in the world. The pigs ingratiate themselves to everyone by sharing technology and entertainment with the birds. But Red is not convinced of their motives. He enlists Chuck and Bomb to go with him to find the long lost protector of the island so they can find a way to save their way of life. The plot is a much expanded version of the still images that precede the video game. In that version, the birds find their eggs missing with some pigs seen making off with them in the distance. We get something like that in the film version, and the movie can actually be split into two parts: the set up of what happens before that scene and the aftermath of that scene. Surprisingly, the set up works pretty well while the aftermath not so much. Which was a surprise to me. 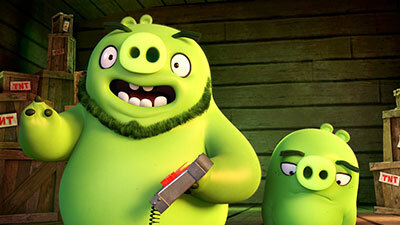 The aftermath is basically the game itself — angry birds attacking green pigs. That’s what we all want to see, right? That should be the easy part! The set up is the hard part — coming up with a back story that explains this world and the characters. I’m not saying everything works in the build up to the battle. But for the most part the writers have done a good giving these basically lifeless video game characters personalities that you could almost see in the game itself, all the while creating a new world they can inhabit that fits as well. But there are some complaints. And many of these are the sorts of things I can mention for just about any non-Disney, non-Pixar film these days: characters almost saying bad words, potty humor (here taken to the extreme), terrible puns. And here’s something I’m seeing more and more it seems: yoga references? Do Hollywood writers really think the rest of the country is that in to it? Especially kids? 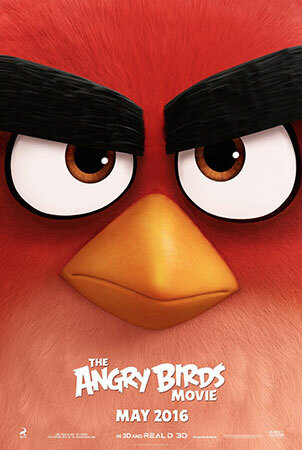 All in all though, this half is inventive and imaginative enough to where you can see how a video game like Angry Birds could actually support a film. The second part of the movie is the birds going after their eggs. And this is where it falls apart. First of all, the transition between the two halves of the film isn’t seamless. The segue between them is very abrupt. Then everything that follows doesn’t flow from we learned about these characters at the beginning. One mildly spoiler-y example: two of the sidekicks we’ve met seem to have some special abilities, but as the birds attack it turns out almost all of them can all of a sudden do things that didn’t come up earlier. Besides that, the story doesn’t really mention what hurling birds at buildings is supposed to accomplish. They just get to the pigs’ city and start slingshotting themselves with no real goal other than that’s what they do in the game. Yes, I get that that’s what Angry Birds is all about, but in this universe where the pigs appear to live in much bigger and stronger structures than the shacks they build in the game, it feels odd that they could destroy things so easily. To be fair, part of my problem with this may be that they set a high bar for themselves in the first half of the film, making a new world for these characters that felt real for them. So seeing them default back to the video game gameplay seems off. The good news is the film is funny. Some jokes fall flat but much more works than doesn’t. And the three main characters couldn’t have been more perfectly suited to work off each other. These guys could easily be exploited for future spinoff or sequel projects. The animation was very nice — well beyond the usual “just good enough” quality that is the default today. Even better, the character designs were spot on. Taking these tiny, flat video game graphics and bringing them to life perfectly had to be a challenge and they could not have done a better job. Their efforts at getting this right will pay off even after this film is off the big screen for years to come. I can’t get over how much these really feel like the counterparts of their video game forebears…uh, forebirds? Forepigs? Another aspect of the production that the filmmakers nailed was the voice casting. 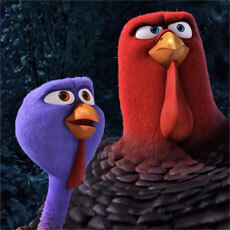 Jason Sudeikis was tailor-made for the role of THE angry bird, Red — so much so that the film might not have worked without him. 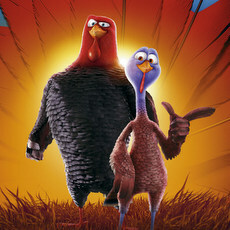 Likewise, Josh Gad as Chuck and Danny McBride as Bomb were ideal for their parts. Maya Rudolph, Bill Hader, and Peter Dinklage complete a group of actors that was perfectly cast. While animation and voice acting are critical parts of a film, story is king. 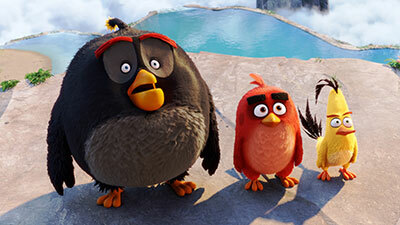 The Angry Birds Movie got a lot right, but in the end didn’t knock down all the pieces. The filmmakers do a good job of taking the video game and creating a new, fuller world and giving the lifeless characters personalities. But by the end all we get is a bonus level of the old game. This is a film that is a lot better than you might expect, but feels disappointing because of the potential it had to be even better. That doesn’t make me angry, but it does make me a little sad.